Most children gain so much weight in their first years that they grow at a faster rate than they ever will later in life, according to Kids Health, a part of the Nemours Foundation. However, some children don’t gain the expected amount of weight. If your child isn’t gaining weight, he might have an underlying condition that requires medical treatment. Many factors can cause a child to gain weight at a slower pace. According to the Kids Health website, breastfed babies may gain weight more slowly than bottle-fed babies in their early months, and some children have genes that cause them to gain weight at a slower pace than their peers. 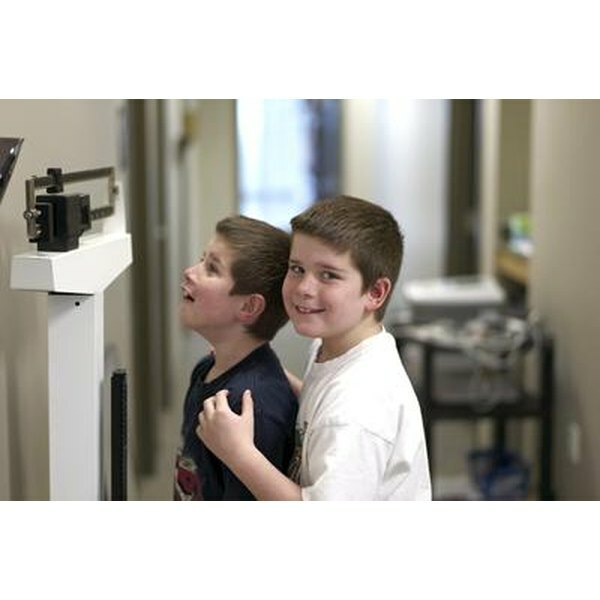 Taking your child to the doctor for regular check-ups will allow you to track his weight gain progress and give his doctor a chance to determine if your child might be at an unhealthy weight for his age. According to the Baby Center website, your child may have lost some weight if he has recently been sick, or his growth may be slowing down due to a normal growth pattern for children his age. Your child should, However, generally be gaining weight as he grows. Your doctor may want to perform further tests if your child has consistently been in the 60th percentile for weight for children his age but he has stopped gaining weight to the point where he dips down to the 10th percentile, advises the Baby Center. If your child is failing to gain weight at his expected rate, his doctor will likely take a medical and feeding history, ask about your child’s activity levels, perform a physical exam and order additional exams such as lab work for a complete blood analysis, a urine test and an electrolyte test, according to Kids Health. She will also likely ask you about any problems in the home such as poverty, stress and trouble feeding your child before she makes a proper diagnosis. A doctor might spend months studying your child before he determines what is causing your child’s failure to gain weight. For the most part, a child who isn’t growing at a healthy rate is either not eating properly or his body isn’t absorbing or using his nutrients as well as it should, according to the Baby Center website. The underlying cause of improper eating or of a nutrient absorption problem also depends on your child's individual circumstances. A child might not get enough nutrients in his diet because his parents have him on a low-fat diet. Alternately, he might not be eating enough because he is distracted when he’s eating or his parents might not able to afford enough food to help him gain weight. In some cases, medical problems such as cystic fibrosis, celiac disease, chronic diarrhea, cleft lip or palate, respiratory disorders, acid reflux, parasites or metabolic disorders may be the underlying cause, according to Kids Health. Your child’s treatment will depend on what your doctor determines is the underlying cause of the problem. Treatment may involve medication for a gastrointestinal problem, upping your child’s caloric intake with the help of a dietitian, taking your child to a speech-language pathologist to help him swallow, or recruiting a family therapist to help reduce stress in the home.